See, I promised I’d do another post without a two month gap! When you start down the road of New Crafts to Conquer, you feel a little bit like Alice once she’s gone down the rabbit hole. When I began to learn crochet, I quickly realised I wanted something different, not more complex, because I can barely follow a pattern, but just different. Somehow, I have no idea how, I thought of using wire instead and then realised there was a whole world out there that had come to that conclusion already. Making normal bead jewellery had never really appealed to me but I knew I would need embellishments but if you google “online bead shops” boy. Big list. And when you’re starting out, you don’t know what you’re looking for, what you’ll need – even what size things are! So it’s hard to know which stores to choose, but I narrowed it down to two; Fred Aldous (which I’d shopped in when I lived up near Manchester) and Beads Direct – I recommend both, depending on what you need. When I was browsing Beads DIrect, they had a sale on and I spied a liitle something. If you’ve read my previous post ‘Finally” http://wp.me/p2tp2d-1b then you’ll know about my mother’s dragonfly penchant. And there he was. A length of cord, two cord ends (and boy did I ping them across the room several times before I managed to work out the best way to squeeze them down! ), a bit of invention with some wire because I ordered too small a jump ring (the ring that attaches the ‘thing” to the cord – see above statement of idiot newness) and a clasp, et voila. So quick and easy, but so pretty. And as always, a delighted recipient. 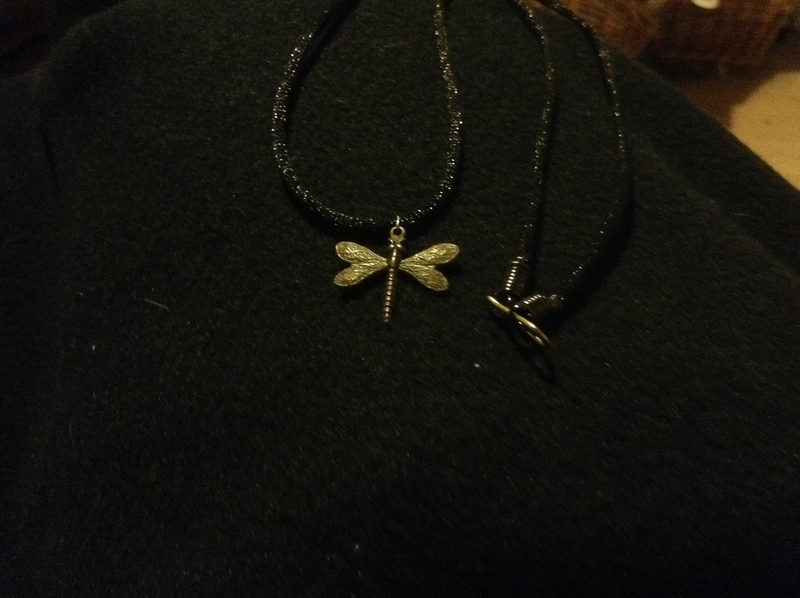 This entry was posted in jewellery and tagged dragonfly, Jewellery making, necklace.